Based on the phenomenally successful stage show – which was based on the book by Victor Hugo – Les Misérables is the story of convicted criminal Jean Valjean (Hugh Jackman) who, when released on parole, reinvents himself as a totally new man. Set against the backdrop of the 1832 Paris Uprising, the story follows Valjean and the people whose lives he touches in his quest to overcome his past. In one way, it is hard to believe that it has taken this long for the musical version of Les Misérables to make its way to our screens, but then the stage production has been so successful, taking on the film would always be a daunting task. Director Tom Hooper of The King’s Speech fame directs a cast made up of half of Hollywood, and creates a movie that is both epic and intimate. First of all, it is worth noting that the songs were recorded on set – the actors were not miming – goes both for and against the film, but this is still an impressive feat. Also worth noting is that acting in a musical immediately turns to melodrama, if only to allow the actors to outshine the music. We knew that Hugh Jackman could dance, but it turns out that he can sing a bit as well. His vocals are not quite strong enough for Valjean, but he does an admirable job. Russell Crowe is the real surprise here; he plays Javert with just the right amount of menace and obsession, and is definitely the strongest male singer of the ensemble. 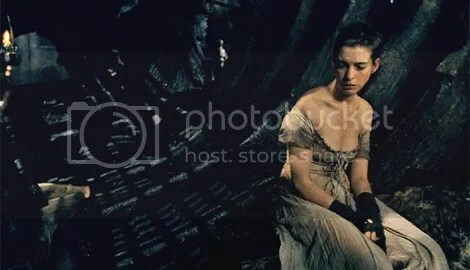 As Fantine, Anne Hathaway is all fragile and resigned, which goes in the character’s favour, but she is also twitchy and a little too watery. Anne Hathaway has already been touted for an Oscar, but while her performance is strong and her voice surprisingly good, this is not an Oscar worthy performance; she has been better. Elsewhere, we have Eddie Redmayne as Marius. His voice is impressive, but his head wobbles when he sings, which is annoying. Amanda Seyfried turns up as Cosette the older, and while it is clear that musicals and comedies are her strong points, her character is insipid and thin, and there are some high notes she probably should have left alone. Samantha Barks as Eponine is a true revelation; she is gutsy and fragile; everything that Fantine should have and Cosette never will be. Barks’s voice is incredible and the fact that she played Eponine for a year on stage certainly stands to her. In terms of sets and direction, Les Misérables promises to be epic from the opening scene where convicts drag a listing ship back to dock. For the most part, the film fails to deliver on this promise though, and even the Barricade sequences end up feeling small and parochial. Where the film really suffers though, is through cinematography. Constant close ups of character’s faces as they sing their solos leave the sequences feeling claustrophobic and restricted. The camera work is self-conscious when it should be invisible, and as the camera whirls, the audience longs for a wide shot to allow them to breathe. Director Tom Hooper has done an adequate job, but this is not the epic Oscar film that we have been promised. Everything feels restricted and claustrophobic and, although the actors give good voice, they are left gurning at the camera that seems perpetually too close. Les Misérables is an epic story of life and love, but this version doesn’t know whether to be small or epic and manages neither. There is nothing too terrible about the film, but there is nothing too great either. Except Russell Crowe and Samantha Barks. Maybe Les Misérables should stay on the stage and retain it’s magnificence.